Jersey and Guernsey Law Review Ltd, 2018, ix + 322. Patrick Galea, senior lecturer at the Faculty of Laws, University of Malta, has published a very learned, ground-breaking book – from the point of view of comparative civil law – which cuts across two main legal systems which have influenced considerably (in addition to European Union Law) the Maltese legal system. It is common knowledge that the concept of trust has been conceived, evolved and developed in common law jurisdictions and that the civil law (ius civile) legal system deriving from Roman Law was not aware of this legal institute in the manner developed by the Common Law. Yet notwithstanding its Common Law origin, it has been grafted upon a legal system the private law whereof is inspired from the Roman ius civile. Surely it must have been an arduous task for the drafter who penned the Trusts and Trustees Act who had to master, before setting out to write the law, both legal systems inspiring ours. It is therefore a huge task which, overall, has been completed successfully. Dr Galea is indeed aware of the drafter’s constant headache when incorporating into Maltese Law legislation from foreign countries – in this case the law of trusts of Jersey into Maltese Law. Precisely this is what he set out to achieve and did so in a remarkable way following the bold footsteps of the drafter of the Trusts and Trustees Act. It is no coincidence that Dr Galea chose to compare Jersey and Maltese Trust Law. Our first attempt at partially regulating trusts dates back to the Offshore Trusts Act 1988 which clearly was influenced by Jersey Trust Law. When Malta came to develop a general law on trusts, the first place to look up, inevitably, was Jersey. Yet Maltese and Jersey’s laws on trust, though similar, are not identical, and the Jersey law was in many ways a model for its Maltese counterpart: Jersey, like Malta, is familiar with both the French Civil Law and English traditions. One must at the same time bear in mind the importance of the Maltese Civil Code and European Union Law which are both influencing and yet limiting factors on the law of trusts. That is why Galea makes the case for an autonomous character of a civil law trust which finds its distant historical origins in the Roman fideicommissum. This of course, would have departed from its Jersey origin, into a civil law institute. The latter takes on board influences from the ius civile legal system and the EU legal system, thereby turning Maltese Trust Law very much into a hybrid system on the same lines of the Maltese mixed legal system itself. 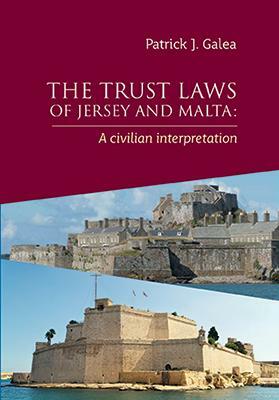 The monograph compares the history and nature of the trust first in Jersey, then in Malta. It evaluates the types of trusts and the nature of beneficiaries’ rights in both jurisdictions and discusses the two small islands’ powers of trustees and the latter’s duties and responsibilities. Needless to say, trusts have a private international law angle and therefore questions of jurisdiction and choice of law issues arise and are indeed addressed in this monograph. So are challenges to the trust regime analysed together with the variation and termination of trusts. This work cannot but conclude by discussing the concept of a Civilian (as opposed to Common Law) trust which, at least at face value, to the uninitiated, appears to be a contradiction in terms, a legal misnomer. Nevertheless, Galea proves otherwise. To use the Latin maxim applicable and which he has adopted to his monograph: quod erat demonstrandum. The author has effectively and without a shred of doubt demonstrated that the “civil law tradition and both [Maltese and Jersey] legislations do not repel the notion of the trust”. Further, in Malta, “trust law allows a foreign trust and law significant respect, space and sphere of operation”. Thus the common law notion of trust has been successfully grafted onto the Maltese legal system demonstrating that both a domestic trust and a foreign trust can co-exist harmoniously within the same confines of trust law.This is a very innovative book. It is a comparative study of Maltese and Jersey Trust Law done by an academic specialist in the field who is not only thoroughly conversant with the Maltese Legal System but who has also mastered two of the main and complex sources of Maltese Law. Through this background and also as a civilian practitioner, Galea was in a unique position to carry out an excellent comparative study of trust laws between two jurisdictions with which we are directly and indirectly bound. This makes it the leading book on Maltese Trusts Law worth reading by whoever wants to comprehend Maltese Trust Law. Prof. Kevin Aquilina is the Dean of the Faculty of Laws of the University of Malta.